Whomp whomp. There're no Crawdad Kid (Lobster Soup Edition)s for sale. 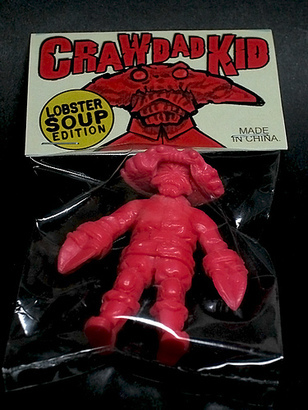 Artist proof edition of the Crawdad Kid released in the same hot pink color as the other single figure artist releases. Came with a custom header card by Ralph Niese and artist trading card by Daniel Yu. During the same release a set of customs were also put on sale. Shipping was $4 for the first unit, $2 each for extras with a limit of 3 regular and 1 custom edition per household. Released via http://doryphunk.storenvy.com/.